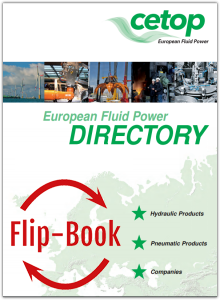 The CETOP Directory gives an overview of the entire European fluid power industry. It provides information on more than 1.000 fluid power companies and their products. Suppliers of standard products and special solutions are featured, together with a comprehensive range of services. This comprehensive and unique publication has been updated on the occasion of MDA Hanover, April 2017. The Directory is available as pdf downloadable from this website, as data base allowing comprehensive searches both for hydraulics and pneumatics, and as software flip-book (Adobe Flash-Version) or software flip-book (HTML5-Version).